di Bocconi Students Investment Club 24 Febbraio 2017 8 min. 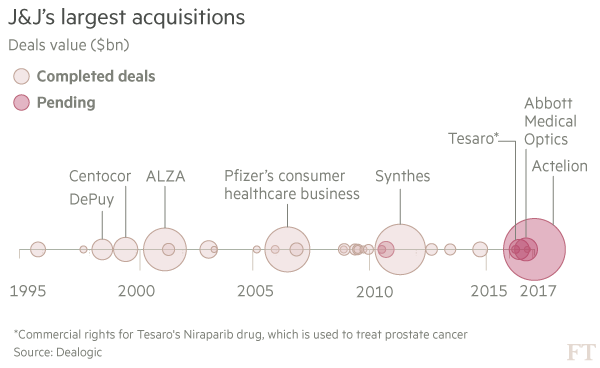 On the January 26, 2017, the US healthcare behemoth Johnson & Johnson announced the acquisition of the Swiss biotech company Actelion for $30bn in cash. The final arrangement came after months of negotiations, which had even halted in December 2016 because of lack of agreement over the purchase price (which J&J raised from $20bn to $30bn over the past three months). Johnson & Johnson is a leading provider of consumer health, pharmaceutical and medical products. Incorporated as a holding in 1887, it operates through 250 subsidiaries in 60 countries. Johnson & Johnson has been active in the M&A market, pursuing an external growth strategy directed to both small and large firms. Some of its most important deals include the acquisition of Novira Therapeutics, a company focused on treatments for Hepatitis B infections, and the purchase of two medical devices producers, NeuWave Medical and Coherex Medical. Furthermore, in September 2016 J&J acquired Abbott Medical Optics for $4.3bn, in a move to increase its scope in the eye care industry. 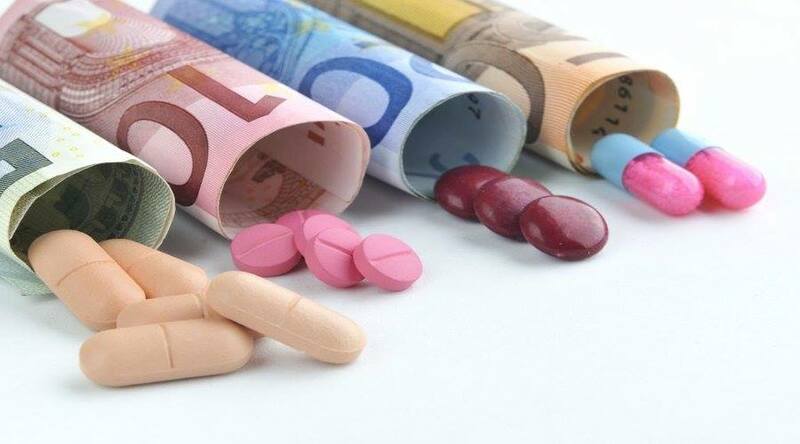 Actelion is a Switzerland-based biotech company specialized in the treatment of rare diseases and it holds a strong leading position in the European market for drugs to treat such diseases. The company was founded in 1997, when a small group of researchers and managers walked away from Roche and decided to pursue the discovery of innovative drugs to cure hypertension. In 2000, Actelion went public with its shares listed on the SIX Swiss Exchange. In 2001, after an unsuccessful study on a drug acting on vascular resistance and cardiac functions, the shares and the company’s future growth prospects went south. However, by the end of the year Actelion was able to recover thanks to the licensing of its first marketed product, Bosentan, used in the treatment of pulmonary artery hypertension. Since then, Actelion has shown a sound base of growth: last year, it delivered a strong performance with sales rising to CHF 1.7bn, an increase of 14% on a year-on-year basis. Moreover, growth was reflected in the rise of diluted EPS measure, which rose 32% with respect to the previous year. Johnson & Johnson will acquire all Actelion outstanding shares by means of a public tender offer to be launched on February 16, 2017. The Swiss company’s shareholders will be offered $280 per share for a total value of $30bn, a 23.2% premium on the company’s closing share price on the day prior to the announcement. The deal will also see Actelion’s R&D unit spun off, thus leading to the creation of an “R&D NewCo” whose ownership will be structured as follows: the company will be listed on the SIX Swiss Exchange with a market cap of $1bn and Actelion’s current shareholders will receive in the form of stock dividend one of the new company’s shares for each Actelion share they own. Furthermore, Johnson and Johnson will be able to share in the upside of R&D NewCo by retaining a significant 16% minority interest, with the option to double it to 32% in the future. The tender offer structure of the transaction suggests the willingness of the parties to close the deal quickly, in order to avoid additional costs coming from delays or threats posed by rivals: as opposed to traditional one-step mergers, tender offers usually lead to a faster conclusion of the deal by avoiding lengthy processes like additional filings and regulatory approvals. All the views expressed are opinions of Bocconi Students Investment Club members and can in no way be associated with Bocconi University. All the financial recommendations offered are for educational purposes only. Bocconi Students Investment Club declines any responsibility for eventual losses you may incur implementing all or part of the ideas contained in this website. The Bocconi Students Investment Club is not authorised to give investment advice. Information, opinions and estimates contained in this report reflect a judgment at its original date of publication by Bocconi Students Investment Club and are subject to change without notice. The price, value of and income from any of the securities or financial instruments mentioned in this report can fall as well as rise. Bocconi Students Investment Club does not receive compensation and has no business relationship with any mentioned company. Il Bocconi Students Investment Club (BSIC) è la più antica e grande associazione studentesca dell’Università Bocconi volta a promuovere un gran numero di attività incentrate sulla finanza, nei confronti alla comunità Bocconiana. Il cuore delle nostre attività è un meeting settimanale dove convengono tutti i membri attivi. Dopo una discussione su recenti e rilevanti tematiche finanziarie, elaboriamo idee di trading, ricerche e analisi di deals che successivamente verranno pubblicati sui nostri sito web e newsletter. Nel corso del semestre i membri producono anche degli special reports che, andando ad abbracciare tematiche più complesse, richiedono più tempo ed energie per la realizzazione. Il Bocconi Students Investment Club organizza anche attività esterne aperte a tutta la comunità Bocconiana. In passato queste hanno incluso: competizioni di market making e trading, eventi di networking con professionisti del settore nonché vecchi membri dell’associazione, case studies, eventi su come ottenere una summer internship e molto altro. Il club si propone di avere tra i 30 e 40 membri attivi in ogni momento, circa equamente divisi tra le due divisioni interne di Markets e Corporate Finance.